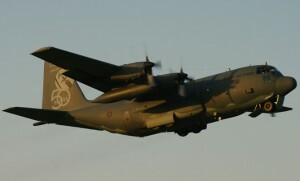 The RAAF’s C-130H Hercules will be retired early to save $250 million in operational and maintenance costs, the federal government’s budget for 2012-13 released Tuesday evening reveals. The eight flyable C-130Hs, operated by 37SQN from RAAF Richmond, were due to be retired from 2013, but last October Defence Minister Stephen Smith and Defence Material Minister Jason Clare announced Defence was developing options to retain the C-130H fleet out to 2016. Current activities undertaken by the C-130Hs currently in service would be redistributed across the remaining air mobility fleet including C-130Js, C-17s and “the replacement for the Caribou aircraft”, Defence Minister Stephen Smith said in a statement. A second ministerial statement lists the Caribou replacement as one of a number of “core” White Paper 2009 projects “Defence will progress” in 2012-13. In the lead-up to the budget the AIR 8000 Phase 2 Battlefield Airlifter (BFA) project to replace the RAAF’s now retired DHC-4 Caribou transport had been the subject of speculation that it was in line for cancellation. UPDATE: The C-27J has been selected to fulfill the Battlefield Airlifter role, for entry into service in 2015. Wow, labour really have messed things up once again. They may be saving a few million dollars but the real cost will be hundreds of Qantas defence services jobs and a huge capability gap. Way to go labour. So what date are they being retired? is it 2013 or immediately? We were told no more flying after 30June, but are waiting for more info ourselves. I hope that the Federal Government is careful who ends up with them, and we do not find ourselves having them being used for activities that are not in Australia’s long-term interests. I am sure that the RNZAF could do with a couple of the best ones, and certainly the Philippines needs better aircraft than it has, given the rather aggressive Chinese stance in the “South China Seas”. Still no good for QDS Richmond, how long till we see a C27J Spartan in Richmond?….5 + years? Really can’t complain, I think the majority of us saw this coming. I thought the C-130hs where meant to kept for the “special forces flight” ? So are the 10 C-27’s going to cost less than the $250m to keep the C-130H’s? I don’t think so. Darren that’s not the point. we are getting a long overdue battlefield airlifter which will be a new capability not spending the money to keep the H models breathing a bit longer. The caribou replacement was being looked at when I was at 38 in the mid ’80s. This is a long overdue decision but a necessary one. I flew in a Pakistan Air Force C-235 a couple of years ago and my lasting impression was how small it was inside. The C-27 was right for lots of reasons. Labour thinking simplistically again. They reduce ability. Don’t mention its replacement. Bring in the long overdue replacement of a capability lost. There is no gain here. Far be it from me to ever defend a Labor Goverment, especially this crap one, but the reality of what has happened, as far as changes, to the composition of the RAAF Air Lift Group, goes back quiet a few years. In 1958 we received 12 C130A’s, then in the mid 60’s we received 12 C130E’s. The A’s where then replaced by 12 C130H and eventually the E’s were replaced by 12 C130J-30 stretched versions. The H in the tactical role and the J’s in the long range strategic role. Now if nothing had changed (and I’ll get to that in a minute) we probably would have seen the H being replaced with J’s and so on and so on, keeping the “one for one” situation in place. But all that changed in 2006, the previous Goverment ordered 4 C17A’s to do the long range heavy strategic lifting, the J’s dropping back to more of a tactical role. Part of that purchase at the time was the retirement of 4 of the H models and the remaining 8 amalgamated with the J’s. Rolling forward to the 2009 White Paper and DCP, it was made clear that when the remaining H models were retired, (which was always going to be around 2013-15 anyway without further updates/upgrades) two additional J’s would be added to the existing 12 J fleet (bit strange really, would have been a big age gap between the original and the 2 additions). This all changed again when the 5th C17 was ordered, the two additional J’s were dropped. Since then of course we have seen a 6th C17 ordered. So in reality, its the C17’s that have replaced the C130H with the J’s dropping back into their tactical role and the 6 C17’s taking over the long range heavy role. Sure it would be nice to have more and more, but the defence budget “pie” is only so big, it can only be sliced so many ways. Added to the above is the 5 KC30A’s with their capability to carry 270 passengers, cargo and of course AAR, plus the C27J’s when they arrive too. All in all I think that in a few years from now Air Lift Group will have a pretty broad range of capabilities ranging from C17’s down to C27’s and in between too. Somewhere in the next decade we will probably see the replacement of the J’s looked at, maybe a Lockeed aircraft, more J’s or a possible replacement, or probably Airbus A400M’s. All of those above steps / plans have been in the public domain for quiet a few years, the only suprise was that the H were retired a few years ahead of schedule to save some Defence dollars. John N – I think your explanation of the history regarding the airlift capability is very accurate and can’t argue too much with it. What I think has been completely overlooked (dare I say deliberately hidden?) with the reliance on ‘J’ for the traditional “H’ roles is the pathetic serviceability rate, hopeless spares provisioning and capability shortfall when compared to the ‘H’, of the “J”. Everyone in the airlift community knows it and are watching with interest for the time when “J” has to stand up on its own to meet the taskings usually picked up by “H” when “J” can’t fulfil. Everyone knows this was not a decision based on capability but on financial (must have budget surplus!) grounds. Very very weak leadership in Gov’t and undermines Defence strategic planners. By the way – be really interested to get an Army view on it all because they are the prime users of these cabs? Just heard on ABC evening news that Australia has handed Indonesia our (C130H) Hercules for future “Disaster Relief” work. I guess the up side of this story is that the ‘disposal’ of these aircraft has been more efficient than the previous RAAF Hercules disposals. Well I hope Indonesia will get plenty of years of further good service out of these aircraft than Australia has managed to do. I imagine they don’t have a government that works on the false economy of achieving a “budget surplus” by getting rid of assets to save on operating costs!? Oh, but I guess we will find the money again to buy more new C17’s when ours are all cycling through maintenance (yes, even with 6 of them) and we have our own disaster relief work to deal with?? I wish we looked at New Zealand as a country appears to make the most return on its investment in military equipment when they get their acquisitions right. Their ‘old’ Herc fleet is happily still operating. So our hercs have gone to new zealand and the Indonesia and where did out caribous go? Has the 6, c-17 replaced both? I saw my first one last week and i was amazed at it as it flew overhead…incredable, so big so dominating in the sky.I just owned the Heavens! then as i sat amazed the sky was sliced up by 2 jets that replaced the f1-11 Why are our craft all grey now and not green or camaflarged? if we have to cut back on spending/it should never be our defence and particulary our defence if world economy is deterioting in powerful or once dominating countrys. Defence means that..defending..Great job army and raaf at Amberly.